When Rahul Gandhi mentioned in his speech at CII conference this year that Europe today was facing a hindu growth rate I got highly scandalised. Congress number two, a party where their only saving grace is that they are still secular (or claim to be) has suddenly started to talk about religion and that too amongst some of country’s most respected (or claim to be) businessmen. I then did what I always do best, I googled. And when I googled the words “Hindu growth rate” I got some weird results. For a while I thought the ‘I am feeling lucky’ option on google has gotten activated automatically and is taking my own side of luck and fortune seriously. But when I went a little deep I realised that this was not some random search gone wrong but actually a discovery that as an economics and religion enthusiast I should have done long long back. What is Hindu rate of growth, per se? No it is not the number of hindus added (or subtracted) in a year. And no it is also not the tracking of their intellectual/monetary or education growth. Come to think about it this is the highest form of convergence between economics and religion. The sky rocketing South Korea bar was resonated not by one country but by a group of four, formally known as (only for economics purpose) as the South east asian tigers which are Taiwan, South Korea, Singapore and Hong Kong. Their highly progressive advancement and development became a stark contrast to the dwindling economy of India which remained at a stable, stagnant 3.5 %. In terms of region or years post freedom all these nations were more or less same yet the incremental performance of the four formed a topic of discussion at many places. And do there was one economist who then coined the most amazing and holistic term in economics for India called “hindu rate of growth”. This term indicated the low 3 to 3.5 % of growth rate that was visible in Indian economy between 1950 and 1980. 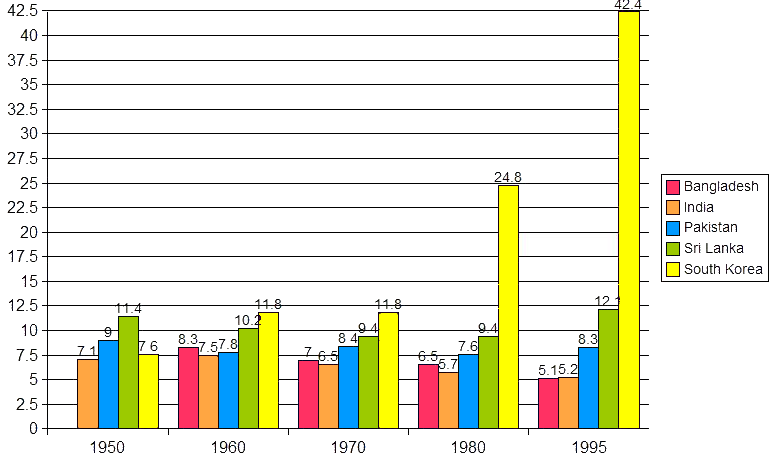 Why term it as hindu growth rate? What had Hindus done wrong to attribute such poor performance to their religion? Actually this was a more popular term given to a research published by an economist at that time. This economist Raj Krishna, elucidated that the very low levels of economy growth in the country was due to the prevalent mindset of the people. He claimed that since most people in the country are Hindus their ideologies and understanding of life has deeply affected trade and other economy driving elements of the nation. Many people would roll their eyes and mock his stand. They might even question the point of allowing such a notion to even exist all these years. But then Raj Krishna had his theories backed up. He said that as staunch followers of fatalism most hindus have a deep tendency to run away from everything and anything materialistic (please remember the hindus of that time in all contexts for now). What exactly is fatalism? Fatalism is actually nothing but a deep belief that almost everything is predestined and all that a human needs to do is follow the trajectory. They proclaimed that man cannot change his destiny and all his deeds have to be rewarded or punished as part of karma. This thinking evolved most Indians to not attach themselves to the idea of profit making activities. Also since they had to be far far away from materialistic elements too purchasing power was exercised to limited sectors. And so luxury or other not so necessary enjoyments were kept mostly at bay. This affected trade in all respects and somewhere stablised the economy at a meagre 3.5%. The economy finally surged up to 6-7% after the liberalisation of India when Manmohan Singh was the finance minister of India. He brought in policies and measures that allowed MNCs to make their base camp here and opened doors for the god fearing Hindus to finally taste what sin feels like. Many people criticise this theory for reasons quite obvious but somewhere personally I feel that this has some ground. Liberalisation as we see it has a lot of benefits but at the same time it has created chunks in our armour. Next article will be taking Hindu growth rate further and elucidating how we have changed and why? Yes, Richa, the Hindu rate of growth had a philosophy behind it and that philosophy has been killed by the liberalisation rate of growth. And yet can we blame the latter? You seem to have picked a difficult topic. I’m waiting for the next post. it was difficult. wikipedia had very little to offer besides the definition and I had to do some soul searching. The next article would be highly independent school of thought so that would be more difficult. I come yo know about the Hindu rate of growth from your post. Very interesting read as you give tons of info. That’s really new information to me too. Look forward to your next post. That’s an interesting read. I never knew such manifestations. for a while back neither did i.. but its a very interesting concept. 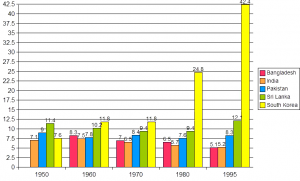 You have done a great analysis about Hindu rate of growth. Also it was nice to know about the concept of fatalism and how this made us believe in the predetermined fate and destiny! and how that can be linked in turn to our slow growth rate. Also before the reforms India followed import substitution and License Raj also took its tolls on the profitability. We had bulky large and corrupt PSUs leading to high prices and the products were not of high quality. Also resulting in slow growth as products were not internationally competitive etc. This was both an eye opener as well as informative…really if it’s comparable to Bangladesh than it’s a shame really…!!! Blaming Hindus for flop socialist policies.Is it just a Marxist ploy to hide their failures ? Karma is as old as Hindus , they were prosperous enough to attract traders and invaders , So this post independence observation has to be trashed in my view. when the whole world came to India for trade during the spice route era, much before the advent of Xtianity or Islam, was it Egyptian rate of growth in India then? This is a lame excuse to cover up failed experiments with socialism and marxism. Raj Krishna must one of those indians who learned about india from western books. One of the main prayer of Veda says..
Om stutamaya varada vedmata prachodayantam pavamani dwijanam ayuhu, pranam, prajam, pashum, kirtim, dravinam, brahmavarchasvam mahyam datva vrajat brahmalokam. MEANING: O’Mother of Vedas eulogized by me and that sanctifies Dwijas bestows on her devotees a long healthy life, Prana Energy or vital force, animal wealth, fame, glory, wealth and a divine brilliant aura. Talk authoritatively about India after learning about India from Indian texts, not from what Britishers excreted when they left. The Holy Vedas asks you to earn wealth, yes not to splurge, but to get with 100 hands to be able to give away with 1000 hands. To live and let live, not compete to destroy. Mad craze for growth rate has given USA $17 Trillion in debt, forgot?